Change the look of your home with Feldco scalloped siding in Chicago. Our scalloped vinyl siding doesn’t only look beautiful but it’s energy efficient and durable enough to handle Chicago’s extreme weather. Unlike other vinyl siding styles, scallop siding has rounded bottoms which gives your home a softer look. It’s often used in smaller areas of your home such as eaves and gables to complement other siding styles. You’ll love the look of your replacement scallop siding from Feldco. Our scalloped vinyl siding is energy efficient thanks to the foam insulation boards installed beneath it. These foam boards prevent heat or air from escaping your home through the walls making your home more energy efficient. You’ll enjoy a more comfortable home no matter the season. Not only will your home be more comfortable but you’ll save you money on your energy bills as well. When your home isn’t energy efficient and you’re losing heat or air, your furnace or air conditioner have to work harder to achieve your desired temperature. By making your home air tight with insulated scallop siding, you reduce the stress on your furnace or air conditioner and they’ll use less power. Scallop siding from Feldco was made specifically for Chicago homes – it won’t warp, rot, crack, swell or expand when exposed to extreme weather. Plus it’s resistant to mold, mildew and termites which will help keep your home looking beautiful. Keeping your scallop siding in Chicago looking beautiful isn’t difficult. 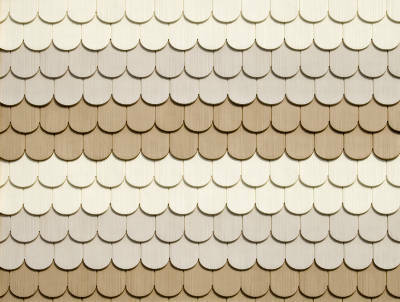 Since the colors are infused into the vinyl when it’s made, your scallop siding will always look as beautiful as it did when it was installed – you won’t ever have to paint or stain it. From neutral colors to something more vibrant, you can customize the look of your scallop vinyl siding. 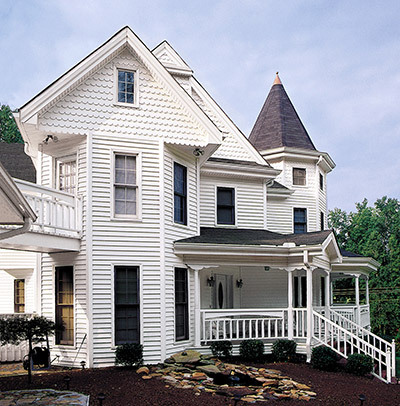 You can create the look of your dreams with scalloped siding.